The space outside your home often takes up more square footage than the area inside your home, and it’s what most people first notice. No matter if you are in charge of maintaining an office building, a college campus or even your own home sweet home, making sure its landscape is well-designed can make a great and lasting first impression. When it comes to your home, living doesn’t have to be restricted to indoor areas. In 2016, one of the most desired features for a home to have includes prime outdoor gathering areas. Creating a functional living space isn’t simply adding a patio set and a few potted plants, though. To truly add value and create an ambient space, you may need an expert’s touch. Landscape architects or designers can masterfully curate the right materials, features, plants and furniture to make your outdoor living space not only incredibly functional, but also seamlessly integrated into the rest of your property as a whole. Perhaps you want a great place to warm up by a fire in colder Midwestern weather. 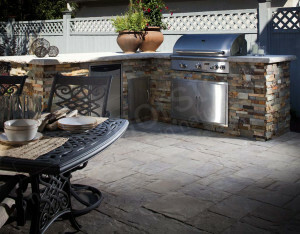 Creating a designated area to sit back and roast a marshmallow or have great conversations with family can be done through a thoughtfully integrated decomposed granite patio surrounding a stone or metal fire pit. Forget the chairs—dot the fire pit surrounding with natural granite boulders to create an outdoor living space that truly integrates with its natural surroundings. By crafting a hub for family and friends to gather outside will add immense appeal and usefulness to all parts of your home. Midnight Blue Decorative Rip Rap creates stunning curb appeal at this Wisconsin home. Most people feel better about going into a home that looks inviting on the outside instead of one that looks rundown or unkempt—this is where professional landscaping proves its value. If you are looking to sell your home, exact return on investment numbers vary as some people report a 20 percent increase in home value up to a 150 percent increase in value. It depends how much you can spend on your landscaping. Kafka Granite has the landscape materials to add the perfect aesthetic to your space. From decomposed granite in nearly 60 colors to naturally round multi-colored boulders, we can supply the unique materials needed to put your yard ahead of the rest. Selecting the right landscape stone for your garden could be just the right feature to complement your home. With cleverly designed landscaping, including the right materials, textures and colors, your home could be the talk of the block. 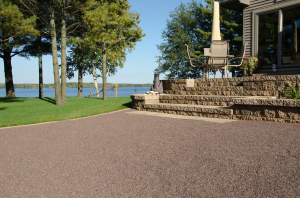 Chocolate Brown Standard Pathway Mix was a great solution for a permeable patio at this Wisconsin Lakehome. 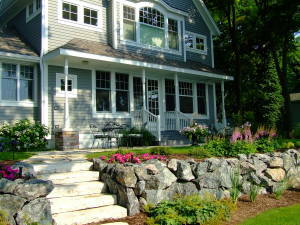 When done properly, a great landscape design can also contribute to the environment. If you’re an eco-conscious person, look into a landscape architect who has specific know-how in how to make your landscape not only look great, but function better for the environment. Natural cobble retaining walls could help stave off erosion, which could stop urban soil from getting into nearby waterways. Creating shaded areas also contributes to diminishing the urban heat island effect by helping lower temperatures in and around cities. And by considering how permeable your groundcover is, you could contribute to groundwater recharge and stormwater control. If you design a patio, driveway or walkway made from materials that offer little to no permeability, you could be harming groundwater recharge and stormwater control as the water has no opportunity to absorb into the earth—instead it runs into storm drains, which in large volumes causes flooding and pollution. If you choose to landscape with a permeable material, such as standard decomposed granite aggregate or landscaping stone, you’ll help rainwater or melting snow get right back to where it belongs; in the soil. If you’re unsure how to create an outdoor space that functions well and looks beautiful, get in touch with your local landscape architect or nursery to start searching for eco-friendly solutions like these. 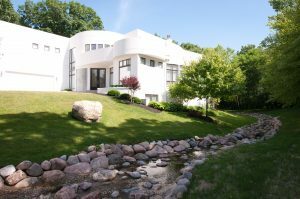 A suburban Chicago residence created a tranquil water feature with Wisconsin Granite Boulders. Lastly, one of the more important aspects to having a landscaped yard, you could add much-needed tranquility. Especially if you live in or around a buzzing metro, creating a livable and peaceful landscape in your own backyard, office courtyard, etc., could be exactly what you need to clear your head. Studies have shown that exposure to nature can improve mood and memory in city-dwellers. Too much stimulation, the standard for your busy city, can weaken some of the mind’s functions. If you take the time and consideration to create quiet spaces outdoors, in a natural environment, you can help make your yard more useful than ever. Block out the noise of the city and enjoy the outdoors! If ever you’ve doubted the power of landscape architecture and design, these four reasons should have you considering its investment, environmental and aesthetic appeal. Kafka Granite supplies the cobbles, permeable pathway mix, landscaping stone, and thin-stone veneer you need to create an inviting and functional landscape that everyone can enjoy. Get in touch today to learn about where your nearest Kafka Granite dealer is, or, if you’re interested in becoming a dealer yourself, simply ask us about our dealer program! Why settle for a few potted plants and a lawn gnome when you could be enjoying beautiful crushed stone patios, winding pathways and natural retaining walls in a yard the neighbors will stop and awe? Make use of your valuable outdoor space now. The quality, composition, and maintenance of your infield, mound and warning track mixes could make all the difference in how your baseball game is played. Kafka Granite knows the detriment that can happen with an ineffective ballyard material—poor ball hops, flooded diamonds, disappointed fans and more. A lot of ballparks, especially little league or municipal parks, don’t have the right kind of infield mix and aren’t maintained as they should be to ensure a good game. Ballyard mixes play a huge role in playability, traction, ball response and safety of the athletes running the bases. There has been a lot of research conducted concerning the proper mix of materials: What is the best ratio of clay, sand and silt after all, and are those even the best playing materials? Kafka has the solution, though, in our variety of excellent ballyard material solutions that will perfect play throughout your next season. Kafka Granite offers several options of infield and warning track mixes to satisfy your ballyard needs. Once you’ve decided how much you are able to spend and how much time you can devote to maintaining your field, you’re ready to make the next decision on your ballyard mix. Our Standard Ballyard Mix is a decomposed granite-option that gives any baseball or softball field premium permeability and stability in a cost-effective way. The Standard warning track mix is a bit coarser than the infield mix as it should provide a more audible “crunch” underfoot so that players can hear and feel when they’re approaching a wall or fence. Our Standard topdressing mix is ideal for cost-effective field improvements as it should be used over your existing field materials. When you’re on the hunt for the right material to replace your existing infield or use for your new ball field construction, consider Kafka’s Stabilized or Hilltopper decomposed granite mixes. Stabilized Infield Mixes are made up of DG preblended with an organic binder while our Hilltopper is a high-quality combination of DG and a water-shedding polymer. Both of these are superior baseball dirt options as they absorb or shed water almost instantly, prevent flooding, provide needed stability and compaction, and don’t turn into mud or dust. Both Stabilized baseball mix retains just the right amount of moisture, which means less maintenance and watering for the groundskeeper, while Hilltopper is a waterless, sealed solution. Hilltopper mixes are also available for your pitching mound, batter’s box, and more. With such little maintenance needed for this mix, you can see instant savings and increased quality of play. If you’re sick of games being rained out or dealing with an unbelievable amount of dust, Kafka has the answer to your baseball dirt needs. The athletes on the field won’t get bogged down in muddy fields, they won’t twist ankles in sunken spots after heavy rain, and they won’t have to reschedule games due to poor field conditions. Instead, players will be able to run the bases with confidence, feel stable and secure, and simply have a great ball game. From cost-effective Standard topdressing to the water-shedding powers of Hilltopper, Kafka Granite has the ideal baseball infield mix that will leave you dry, safe and playing ball. Expect consistent ball hops and don’t get lost in dust clouds ever again. Minimize how much watering and screening you have to do, and sit back as spectators admire the field as much as they admire the athletes. Call Kafka today to discuss your baseball infield, warning track and pitching mound needs. By understanding a bit more about your project and budget, we can match you with the right decomposed granite-base baseball dirt for you. We can even send over samples. Stop compromising the integrity of a good baseball or softball game by keeping your damaged or deteriorated field. Instead, rejuvenate it with a topdressing or rebuild with the best baseball and softball mixes on the market. Experience how the right mix can truly change the game.